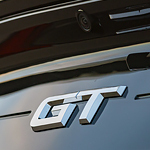 New Ford Mustang Model Options | Karl Flammer Ford Inc. The iconic BULLITT trim is back with the latest from Ford’s Mustang team. Noted as the best-selling sports coupe for 2018, the latest style for this sports car has drivers in a fever. You get strong power from the four-cylinder standard engine, but you can also upgrade to a V8. There are 14 different styles to choose from, so it’s easy to customize for your goals on the road. The cabin is incredibly spacious and high-tech in this latest version. The BULLITT has some of the best styling inside and out, but of course, everyone is interested in the Shelby GT350 and GT350R, which can put out 526-horsepower. These come exclusively with a manual transmission. Want to test drive the all new Mustang? See the all new features, including blind spot monitoring, rearview parking assist, and lane departure assist. Stop by Karl Flammer Ford Inc. for more information.